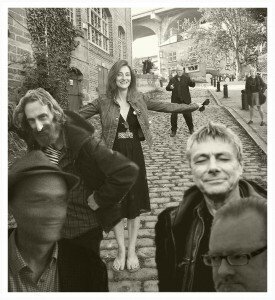 No one has ever accused the Mekons of being an especially “family friendly” ensemble, but two longtime members of the Leftist Punk Band That Refuses To Die guitarist and singer Jon Langford and vocalist Sally Timms have decided to take a stab at the children’s music market, and the result is an unexpected delight. As the Wee Hairy Beasties, Langford and Timms team up with alt country chanteuse Kelly Hogan and the rollicking acoustic trio Devil in a Woodpile, and on Animal Crackers they’ve cooked up 14 tunes lively enough to please even the most fidgety youngster, and which are also witty, swinging and guaranteed to make the grownups in the room tap their toes. Most of the numbers deal with curious critters of one kind or another ants with attitude, dancing turtles, flies feasting on breakfast cereal and ducks with a taste for trad jazz and the wordplay is silly enough to make children giggle, but smart enough to still appeal to the more mature listener (especially the parade of clichés on “Animal Crackers,” the Muddy Waters lift on “I’m an A.N.T.” and the playfully ethereal “Toenail Moon”), though some parents may find themselves at a loss to explain the convoluted story of “Cyril the Karaoke Squirrel.” All the musicians on board brought their A Game for these sessions, with Devil in a Woodpile picking up a storm (especially Joel Paterson on guitar and lap steel) and Timms and Hogan making the most of their frankly wonderful voices; even veteran troublemaker Langford proves to be a charming and gregarious frontman in this context. With Animal Crackers, the Wee Hairy Beasties threaten to turn your kids into the youngest alt country/roots music fans on the block, and chances are good you won’t mind one bit you might even join them. Kids’ hootenannies don’t get any more fun, or parent-friendly, than this rootsy collection. And by ”rootsy,” we mean it both in the musical sense and the literal one: the new folk-rock collective that calls itself the Wee Hairy Beasties tends to favor sweet songs about insects and other crawly critters over the more photogenic animals. But then, the group’s ”up from the underground” credentials are redoubtable. Jon Langford and Sally Timms are members of the Mekons, one of the best, most critically acclaimed, intellectually inclined British punk bands, dating all the way to the ’70s. As American émigrés, they’re no longer really British, and they’re no longer very punk, either, since they’ve mostly concentrated in recent years on folk and country side projects, like this one. They’re joined in this project by fellow alt-country luminary Kelly Hogan and a washboard/clarinet/kazoo-favoring trio called Devil in a Woodpile, and all of ’em sound like they were born to slum in kidville. Though you can also bet there’ll be a lot of childless alt-country fans responding to this crawl of the wild. There’s not much of a reason to give a damn about kids’ music. But when it’s put out by an indie label like y’all-ternative Bloodshot Records, you gotta wonder. The Beasties (whose ranks include members of the Mekons, Waco Brothers and Devil in a Woodpile) exist under the lofty thesis that kids’ music need not be agonizing for adults. For the most part, they validate that on this winsome album. The brisk, short melodies and dippy, personifying lyrics about animals will nab children. But the integrity with which folk-music traditions (country, blues, bluegrass, swing, Hawaiian, ragtime) are observed will impress roots music enthusiasts. Fans of acts like Asylum Street Spankers and Squirrel Nut Zippers won’t find this much of a leap at all. Isn’t any kids’ record that doesn’t systematically dismantle a parent’s sanity a successful one? Jon Langford, member of the influential British punk band The Mekons, found his way into the kids’ music scene by pure coincidence. When his son took a class at the Old Town School of Folk Music in Chicago along with the offspring of Wilco’s Jeff Tweedy and Califone/Red Red Meat’s Tim Rutili, a music teacher asked the three dads to put together a show for little rockers. After a successful gig at the School of Folk, and another at the Brookfield Zoo in Brookfield, Ill. with singer and fellow Mekon Sally Timms, Langford decided to take kiddie music seriously. Around the same time, he and his family vacationed in his homeland of Wales, where he spent a lot of time hanging out with his kids on the beach and making up songs. Today, Langford fronts The Wee Hairy Beasties and the group releases their new CD “Animal Crackers” (Bloodshot Records) on Sunday, Nov. 5 at 11:30 a.m. at Alverno’s Pitman Theatre, 3431 S. 39th St. The Wee Hairy Beasties sell out most of their Chicago shows, and although they technically cater to kids, they have many adult fans. Langford says he was inspired by Dan Zanes’ efforts to create listenable music for the entire family, but being a punk rocker at heart, Langford wanted to make edgier music. “Our songs are a bit more twisted. You might say it’s mildly disturbing children’s music. My kids don’t really like the hippie stuff,” says Langford, who has two sons: Jimmy, 9, and Tommy, 4. 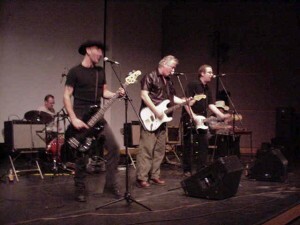 Aside from being a legendary punk rocker, Langford fronted a number of alternative-country bands including the Pine Valley Cosmonauts and The Waco Brothers, which he formed with Milwaukee ex-pat Dean Schlabowske. He is also a painter, printmaker and political activist. Langford, who moved to Chicago in 1991, has a few other Milwaukee connections. He is friends with Alverno’s David Ravel — who invited Langford to do a multimedia art show at Alverno in 2003 — and WMSE’s Tom Crawford. Langford was also in discussions in the 1980s to produce a single for Milwaukee band The Blowtorch; a project that never panned out. Langford says gigging for kids is different from doing adult shows, and in some ways, more difficult. “Kids don’t care who I am or what I’ve done before, they just want to be entertained in the moment. It takes more focus because if you lose their focus, you’re dead,” he says. But even sinners have kids, too, so the time is certainly ripe for Bloodshot to get into the popular children’s music arena with its new all-star band Wee Hairy Beasties and the new “Animal Crackers.” And yes, given Bloodshot’s alt-country leanings, we’re guessing that the double meaning of “cracker” is intentional. The Beasties are Mekons and Waco Brothers frontman Jon Langford (as “Cyril the Karaoke Squirrel”), alt-country divas Kelly Hogan and Sally Timms (as “Marjorie the Singing Bee” and “Monkey Double-Dippey,” respectively), backed by the band Devil in a Woodpile, a favorite of Madison’s Sugar Maple Traditional Music Festival. The group invokes the stomping blues of Muddy Waters on “I’m an A.N.T.” (“You can put down that powder, lay down that spray”) and has a gorgeously light touch with dreamy pre-World War II jazz-blues on “Housefly Blues.” Some of the songs slip by in a delightful, disposable instant, like “A Newt Called Tiny.” But “Toenail Moon” has the ring of an instant classic about it, a flat-out lovely song that will lodge itself in the brains of both kids and their parents. And that’s the point of this new generation of kids’ music CDs, to make music that will engage the kids and not drive their folks up the wall. “Animal Crackers” accomplishes this, and fortunately Bloodshot’s musical menagerie doesn’t include any purple dinosaurs. Children’s records are no stranger to the Bloodshot catalogue. The label dished out a pretty darn good compilation in 2002 called The Bottle Let Me Down: Songs for Bumpy Wagon Rides that related as much to the kiddies as the parents who don’t mind sucking on a tall one or two at playgroup. This latest dip into the kids music corral features the Wee Hairy Beasties, a group of Chicago-based rockers several of whom, like many of their ilk, ventured into the kid-bearing years after the years of playing the clubs. On Animal Crackers, The Wee Hairy Beasties (Jon Langford, Kelly Hogan, Sally Timms, and Rick Cookin’ Sherry) bring a keen eye and a subtle humor to their children’s sides espousing on everything from flies on your potatoes (“Flies On My Taters”) to Animal Crackers, to pet newts, to the glory of Glow Worm. It’s sweet and clever stuff, and a barrel of fun. As a music lover, you answer to no one. Your tastes are impeccable. Friends gasp in awe at the size and selection of your CD collection. Were there a seismograph for hip, your iPod would send it off the charts. Then you have a kid. If only there were some middle ground. If only there were artists making music adults and kids can both enjoy. A passel of artists is aiming to do just that, including Laurie Berkner, who has been compared to Sheryl Crow and Indigo Girls; pop-rockers Milkshake; and even Jack Johnson, the singer-songwriter who wowed the younger set with his sentimental soundtrack songs to last year’s “Curious George” movie. In some cases, though, these are performers to whom hip parents grooved in years past. Quirky popsters They Might Be Giants have cultivated a younger audience with CDs, videos and a book aimed at pre- and grade-schoolers. Dan Zanes, formerly of roots rockers The Del Fuegos, has become one of the biggest names in family music with a series of CDs drawing heavily on folk. More recently, Jason Ringenberg, who led alt-country firebrands Jason & the Scorchers, has adopted the Farmer Jason persona. Jon Langford and Sally Timms of agit-punks The Mekons are part of the animal-themed Wee Hairy Beasties, which plays a hyperkinetic mix of country, punk and blues. Kids music is just one part of They Might Be Giants’ workload, and Wee Hairy Beasties (which also include Kelly Hogan and Rick “Cookin'” Sherry) aren’t likely to give up their day jobs. Zanes, however, has seen his own profile soar. The Del Fuegos never were able to break out of the college radio market and were dropped by their label after three albums. Now, though, Zanes is one of the best-known family entertainers and is developing a series for the Disney Channel. Children’s music is one of the few bright spots for the music industry. From Jan. 1 through the end of May, children’s music sales had nearly doubled, from 3.7 million to 6.4 million, from the same period in 2005, according to Nielsen Soundscan. For the week ending Oct. 15, children’s music sales for the year were 11.1 million. Music sales of many other genres are down. For most of those involved, the impetus was to create music their children would listen to yet wouldn’t drive parents crazy. “A lot of things we bought for our kids because the cover looked nice, seemed really tame and had not much to do with the way kids really are,” Langford says. Wee Hairy Beasties’ album “Animal Crackers,” on the other hand, captures some of the manic, frantic silliness of children. 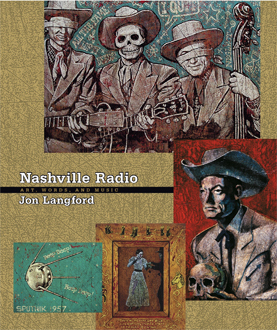 Langford claims it’s close to what he does with his grown-up bands The Mekons and Waco Brothers. Several artists stressed that children’s music need not be sanitized, either lyrically or musically. Playing keyboards for The Lounge Lizards, Evan Lurie shocked jazz fans with irreverent and unorthodox takes on tunes by Thelonious Monk. Writing songs for the Nick Jr. television series “The Backyardigans,” he finds children less easy to rattle. Not so their parents, though. For each episode, Lurie writes four or five songs in a specific genre. He has covered reggae, rai, klezmer, Gilbert & Sullivan, Kurt Weill and more. Kids don’t seem to mind a little mayhem in the lyrics, either, Langford says. Langford recalls loving folk songs he heard as a child sung by Burl Ives. Parents also enjoy music that doesn’t talk down to the kids. “We were so happy to find some music that was lyrically appropriate for kids (lots of old folk songs) but was still musically interesting and not mind-numbing for us to listen to (repeatedly),” Zanes fan Dawn Goddard of St. Petersburg writes in an e-mail. Zanes’ philosophy comes from his folk background. Prior to playing rock ‘n’ roll, Zanes attended Pete Seeger concerts and borrowed Leadbelly albums from the library. Inclusion is much on Zanes’ mind. This year’s “Catch That Train!” CD includes a version of the spiritual “Welcome Table,” which Zanes intended as a comment on the immigration controversy. Zanes says the feedback he gets from parents on issue or message songs is mostly positive. Ringenberg, the son of a farmer, has long supported programs aimed at helping family farms. He tones his advocacy down a bit as Farmer Jason, but the message still is there. Of course, kids music doesn’t have to teach a lesson. It can just be fun. They Might Be Giants – John Flansburgh and John Linnell – have put smiles on listeners’ faces with their oddball tunes since the late ’80s. They began appealing to a younger crowd at the urging of the Rounder record label, which asked them to record the album “No!” in 2002. “I don’t know what they were thinking,” Flansburgh told the Tribune earlier this year. Some parents and kids, though, prefer the Giants’ grown-up output. “I think a lot of TMBG non-kid stuff is perfect for kids too,” Stephanie Meckfessel of St. Petersburg writes in an e-mail. “We kind of think their regular albums are pretty good for kids!” Dawn Goddard writes. Husband Ethan plays the Giants’ “James K. Polk” on his ukulele for Hudson. The song is “a nice little history lesson,” Goddard writes. Whether it’s a message song that opens a dialogue between parents and child, or a simple folk song that the family can play and sing together, this music has the potential to bring families closer together in a way “children’s music” can’t. “When my daughter was born, I found a lot of music that was particular to the experiences of children,” Zanes says. “What I didn’t find was all-ages music. “It just rolls off the tongue,” Zanes says with a laugh.